THE STORY BEGINS on July 8, 2017, in Florida’s hard-work-and-cold-beer Panhandle. Members of the Ursrey family, eight in total, are enjoying an evening together at the beach. 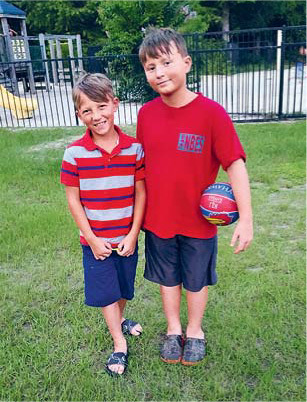 At around 7:30 p.m., as the sun sinks lower, the two boys—Noah, 11, and Stephen, 8—take their boogie boards and wade into the waves without the grown-ups noticing. When the kids are about 65 metres from shore, they realize that the ocean has tugged them out to sea. After trying hard and failing to paddle back in, they start waving and screaming for help. But the lifeguards have clocked out for the evening. There’s a yellow flag flying, indicating caution, but most of the regulars were scarcely paying attention to the warning. The boys have been struggling for several minutes when Brittany and Tabatha Monroe, a married couple from Georgia, stroll by. They don’t see Stephen and Noah at first, but they hear them. 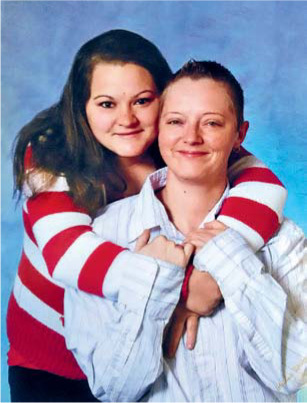 “If someone yells for help, I’m going to try to help if I can,” Tabatha says. The two women leap into the ocean and easily reach the brothers, who are still in water less than six feet deep. The women reassure the frightened boys and grab their boogie boards—then discover that they, too, are in trouble. They can’t make any progress back to shore and can barely graze the sandy bottom with their feet. AFTER A FEW MINUTES, it becomes clear that they are all trapped in a rip current. Rips move perpendicularly to the shoreline and can quickly exhaust swimmers who try to fight them; the National Oceanic and Atmospheric Administration reports that 93 people drowned in these flows in 2017. Safety experts warn against fighting the pull and advise that anyone trapped in a rip should swim parallel to shore until finally exiting its deadly belt—or float calmly to preserve energy if exiting isn’t possible. The women try swimming, but no matter which way they move, they’re still stuck. Brittany, who has eight-year-old Stephen, is petite and struggling to keep her head above water. Panicking, she releases the boy and makes a frantic push for safety. By now, some teenagers have heard the commotion. One of them, a boy who is tall enough to keep his feet on the ocean floor, dashes into the water, grabs Brittany and hauls her back to shore. Meanwhile, Tabatha can feel herself being pulled further out. She is treading water, already exhausted and beginning to despair now that she’s trying to save both boys alone. The waves keep plunging her underwater as the two boys bob next to her, holding their boogie boards. Onshore, Brittany is hysterical. Shaun Jernigan is heading back to his car but stops. “What’s wrong?” he asks her. “My wife is drowning!” Brittany says. Shaun, a hulking house framer from Georgia, looks out and sees the trio of heads through the waves. He immediately strides into the water. A year ago, Shaun had been caught in a rip current in this very spot and narrowly escaped drowning. The feeling of the ocean lapping about his nose and ears is familiar—uncomfortably so. Still, he wades out as deep as he dares, up to his chin. Four metres still lie between him and Tabatha and the boys. She’s screaming for help, and while it’s painful to abandon them, he knows that if he continues, he’ll become another victim. He turns around. IT’S AROUND THIS TIME, about 15 minutes into the rescue, that Roberta Ursrey, the boys’ mother, returns from the bathroom and looks for her children. She is shocked to see them floating with their boards much further out than they’re allowed to go. She hollers at them to come ashore, and they scream through tears that they’re stuck. She can’t make out what they’re saying but can tell that they’re upset, so she flings her phone onto the sand and sprints into the water, fighting the waves to get to her sons and the stranger who is trying to save them. “I’m going to help you,” Roberta says. She seizes the boys’ boards and starts kicking for shore but quickly discovers what others had before her. It is nearly impossible to make headway in any direction. By now, people on the beach have begun to notice the stranded group, though the gravity of the situation isn’t entirely clear. A few yards away, an Asian couple are treading water and trying to inflate a child’s ring-shaped flotation device. They likely came out to help the boys, but when Roberta tries talking to them, she runs into a language barrier. Just beyond them is a young man on a surfboard who is attempting to catch waves. Tabatha and Roberta scream to him for help—they know that if they could all cling to the surfboard, they would survive until a rescue boat comes. But the surfer misunderstands, laughs and paddles away. He moves toward them anyway. “Give me one of the boys,” he tells his aunt. Roberta can’t bring herself to relinquish either of her children. Justin finally persuades her to give him 11-year-old Noah and sets out to tow him on his boogie board toward shore. But Justin, too, learns that he’s no match for the force of the water. FORTUNATELY, MORE HELP is on the way. Shaun Jernigan has told his daughter to call 911 and has returned to the water’s edge. He’s frantically searching for a rope or other lifesaving equipment when he sees a man running toward the water. He tries to stop him. “Don’t go out there!” Shaun says. “We’re trying to get them out!” But the boys’ father, Bryan Ursrey, charges in anyway. “That’s my family out there!” he says. Shaun spots two police officers and rushes to them. The officers not only refuse to help but also attempt to stop him and any other would-be rescuers from entering the water. (Deputy Police Chief Chad Lindsey later explains in a televised interview that the officers thought it was too risky to let anyone swim out to the boys.) Shaun ignores them and instead flags down a few other beachgoers, and together they start to wade in. 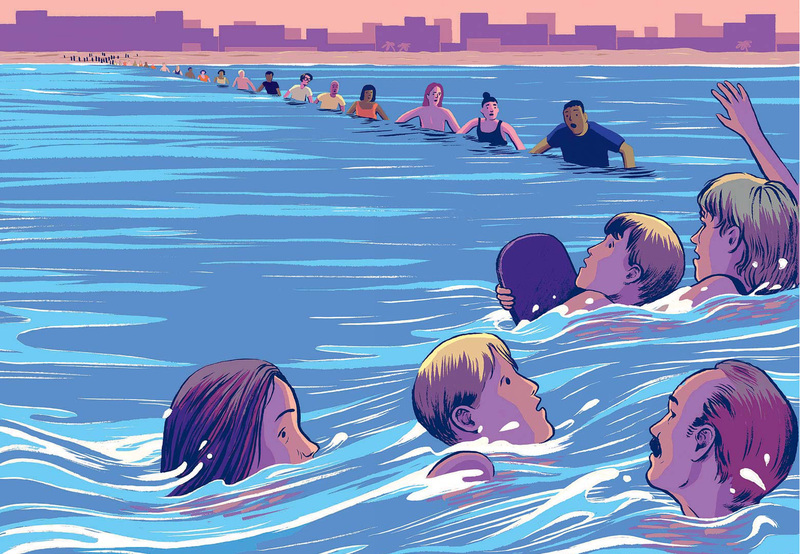 To keep from losing their footing in the current, they hold on to one another, and that gives them an idea: why not form a human chain extending from the beach out to the swimmers? As long as the furthest link stays connected to those whose feet are firmly planted in the sand, they’ll be safe. Then the most astonishing thing happens: one by one, link by link, total strangers wade into the waves and grasp one another by the wrists. “Yeah, I can do that,” Jessica says. When she turns around, she sees her husband swimming just behind her. “I couldn’t leave you out here,” Derek says. Derek grabs Noah’s board from Justin, who has been trying desperately to get his young cousin over to the chain, in part by plunging beneath the waves to “walk” over the ocean floor while holding the boogie board over his head. “YOU JUST HEARD THE CHAIN, ‘PULL! PULL!’ ALL THE WAY BACK TO THE BEACH,” SAYS DEREK SIMMONS. “I was telling the boy, ‘Everything is going to be all right. Just stay on your board,’” Derek says. At one point, Noah falls off, and Justin grabs him by his trunks and hauls him back up. “As soon as I got him to the end of the chain, where Shaun was, it was like lightning. Shaun started passing him back, and you just heard the chain: ‘Pull! Pull!’ All the way back to the beach. Everybody on the beach pulling them in.” It takes only a minute or so for the chain to ferry him to the beach. Jessica has been helping little Stephen make his way over to the chain, which is now some 70 volunteers strong, and when he reaches it, he, too, is whisked ashore. Next comes Roberta, who is so exhausted that she blacks out just as Jessica helps her connect with the chain. The people pass along Roberta’s limp body, one link to the next, and deposit her on the beach. It will be five minutes before she wakes up. As it turns out, that was a blessing, considering what’s happening to her mother out in the ocean. 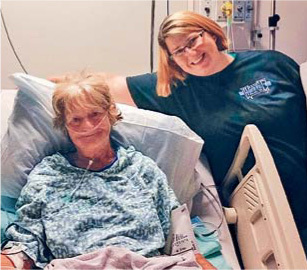 BARBARA FRANZ, 69, saw her two grandsons struggling and swam into the danger—despite the fact that she’d had two heart attacks in the past two months. Within minutes, the water overwhelmed her. She’s still out there when Roberta and the boys are brought to shore. In fact, she doesn’t realize they have been rescued as her body continues to fail her. Justin struggles to float his grandmother along on a boogie board, but she keeps flopping off. Over and over, the waves hit them, she goes under, and Justin brings her back up, being careful of his broken hand. Derek swims up to assist. By now, Barbara has become delirious and incoherent. Somehow Justin swims to the end of the chain to add a link and ensure that his grandmother is taken ashore. When the man next to him grabs his injured hand, Justin hears the bones rebreaking. The man recoils but Justin reassures him that it’s okay. FORTY MINUTES INTO the rescue, everyone is ashore except for Tabatha, who flounders about six metres from the end of the chain, and the boys’ dad, Bryan. Tabatha is beyond exhausted, beyond despairing. “Hold on, baby girl,” Bryan tells her. “I got you.” Again and again he digs the tips of his toes into the sand and tosses her forward—and again and again, the sea undoes his feeble progress. THERE’S A GREAT SCRAMBLING IN THE SURF, AND THE CHAIN FORMS AGAIN, ALIGNED TO RESCUE TABATHA. Shaun and the others in the human chain see what’s happening, and the shout goes out to move the rescue operation down the beach, closer to where Tabatha has drifted. There is a great scrambling in the surf, and a moment later the chain forms again, aligned to rescue Tabatha. A fresh swimmer splashes up to her. “Come on—grab my arm,” he says. Tabatha reaches for him and he tugs her the last few metres to the chain, which zips her back to the beach. In the meantime, Bryan manages to find his footing and wades in on his own steam. Everyone, miraculously, has made it. THE VAST MAJORITY of the rescuers from that day remain anonymous: the teen who helped Brittany ashore, the lanky young man who swam Tabatha in, the Asian couple. Each deserves to be celebrated—but won’t be. This humbles the Ursreys almost beyond words. “There were people there who didn’t know how to swim whatsoever, and they were up to their necks in water, holding on to other people,” says Bryan. “It didn’t matter what colour you were, what age you were. People stopped what they were doing. They got off their phones, tablets, whatever, and helped my family out of the water,” he says. I always thought that “thriving” would come when everything was perfect, and what I learned is that it’s actually down in the mess that things get good.